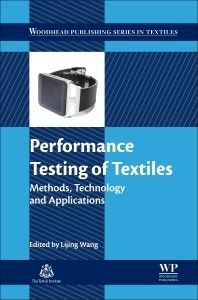 Performance Testing of Textiles: Methods, Technology and Applications examines the developed and established methodology for testing performance textiles, also summarizing the material properties for advanced applications. This book emphasizes reproducible tests using commonly used experimental methods reported in scientific literature and internationally recognized testing standards to quantify textile material properties and performance. After an introductory explanation of key fiber and textile properties and testing methods, the book summarizes electronic testing theories, technologies, and instrumentation for performance textiles. Also covered are aspects of military textile, medical textile, sportswear, smart composites, and wearable textiles which, as examples, present the latest research and results related to performance textile testing and applications. Performance textile suppliers, research specialists, manufacturers, academics. Dr. Lijing Wang is Associate Professor at the School of Fashion and Textiles, RMIT University, Melbourne, Australia.